This is a Northern Gannet. It is a large seabird that nests colonially in the North Atlantic and Arctic Oceans. On the map below, nesting colonies are shown as green dots, and the wintering range is shown in aqua. They are unique among boobies (Sulidae) because they prefer high, northern latitudes to more tropical climes. Though it's tough to tell from this photo, they are quite large; they average 3 feet in length, and they sport a wingspan of nearly 6 feet. They subsist entirely on fish and such, and they are well-known for their arial acrobatics as they plunge into the ocean in pursuit of prey. 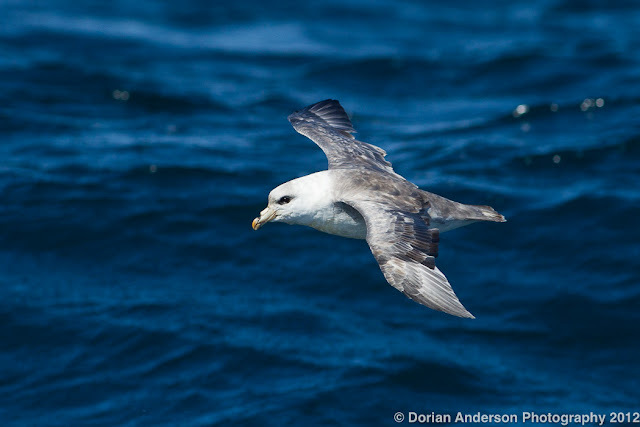 So, why the heck am I writing about an Atlantic seabird in a post about California?!??! 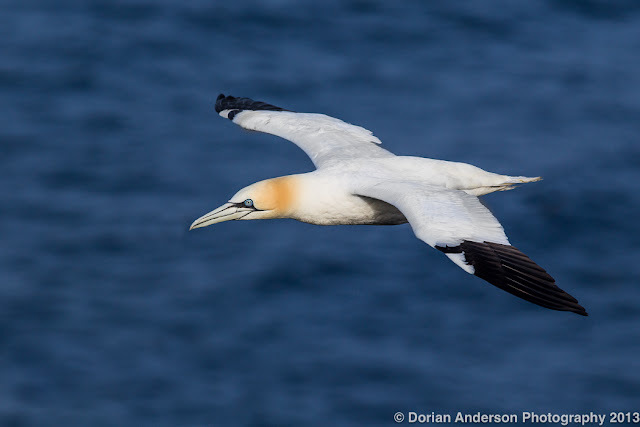 Well, in April of 2012 a Northern Gannet appeared on the Farallon Islands, 30 miles west of San Francisco (please see my recent post on the Farallons). Birders were understandably shocked by the first Pacific record of Northern Gannet but were even more surprised by how long the wayward bird stayed on the Farallons - 2 full years! The bird finally disappeared in March of 2014 only to reappear on Alcatraz in San Francisco Bay just two weeks later. It spent that spring and part of the summer in the bay before returning to its more familiar Farallon haunts. Since then, it has bounced between points on those islands, SF Bay, and points along the coast of San Mateo County. 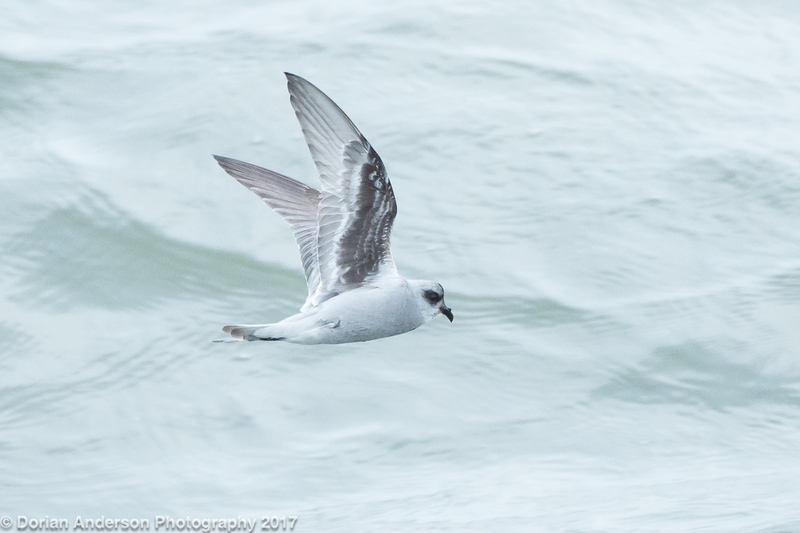 The bird generally spends a few months in a particular area before moving elsewhere for an equivalent length of time, and it is occasionally seen from seawatches and on pelagic trips as it transits between its preferred spots. I first saw this bird in Half Moon Bay in February of this year when I came to SF to look for an apartment. At that point, it had been in the Bay Area for nearly 5 years. Since I moved to San Mateo in May, sightings of the bird have been very thin; There was only 1 summer observation, that being on the Farallons on July 17. So, when the bird recently reappeared at Devil's Slide just south of Pacifica on August 2nd, I jumped at the prospect to add the bird to my slowly growing San Mateo County bike-only birdlist. I was in Arizona when the bird was rediscovered, so my first attempt at the bird had to wait a while and ultimately resulted in a 38-mile, round-trip miss; 2,700 feet of climbing to get over the coast range and back made that strike-out hurt even worse. bike to this from my apartment! Undaunted by failure, I yesterday made a second attempt at the bird and was successful! I spotted the bird among a HUGE feeding frenzy of birds at least a mile from shore. I am familiar with this species from my time in the east, so making the ID at such a distance was very easy. It wasn't doing much, just floating around, but it shortly took off and flew into the rock where it has been seen recently by other birders. 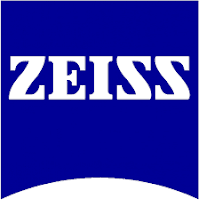 This was taken through my Zeiss Gavia 85 at 60x. were to the right of this - thousands! After that success, I headed south along the coast to do a bit of birding at Half Moon Bay. I headed for the harbor, set up my scope, and surprisingly saw a Northern Gannet sitting on the aptly named Sail Rock 400 yards from shore. Incredibly, the gannet had followed me 10 miles south, returning to a roost it had in the past used though not for the previous 6 months. I thought the whole thing was really fortuitous. with Half Moon Bay extension - 47 miles. So, of the 130 or so birds species that I've managed to find in San Mateo County using just my bike, this Northern Gannet is by far the best quality bird. Chasing rarities on a bicycle is a horribly inefficient process, but I hope to defy those long odds as I do more of this sort of thing in the future. Finding birds from the bike in an incredibly rewarding feeling, and, regardless of the outcome, I'm staying in good shape. It's really cool that this bird has survived and taken up what appears to be permanent residence in Northern California. We often think of wayward rarities as disoriented or weak, and, though that might have been the case when he first appeared, he seems to be doing just fine today. Since he's so large and conspicuous, he's easy to find if he's around. It's because of this visibility that we've been able to track his movements during his California vacation-turned-staycation. Post #113 - Preparing for fall pelagic season! Come visit me in CA! Shorebird migration is now well underway here in the Bay Area, and soon other species will be following those migrational pioneers south. Included are pelagic species, species that are so highly oceanic they spend almost all of their non-nesting time far offshore. Albatrosses, petrels, shearwaters, storm-petrels, jaegers, skuas, alcids, and phalaropes all fall into that pelagic category, and one can reasonably expect to see a nice cross section of these birds on any fall pelagic trip from the Northcentral California Coast (Monterey, Half Moon Bay, and Bodega). September and October are prime time, and there are a number of boat/tour operators that can get you offshore to experience the spectacle of pelagic migration. These include Alvaro's Adventures, Monterey Seabirds, and Shearwater Journeys. All of these operators have years of offshore experience and can get you onto to birds and marine mammals that you want to see. I will be acting as a spotter on a number of these trips, so, if you'd like to join me at any point, please see my schedule at the end of the post. 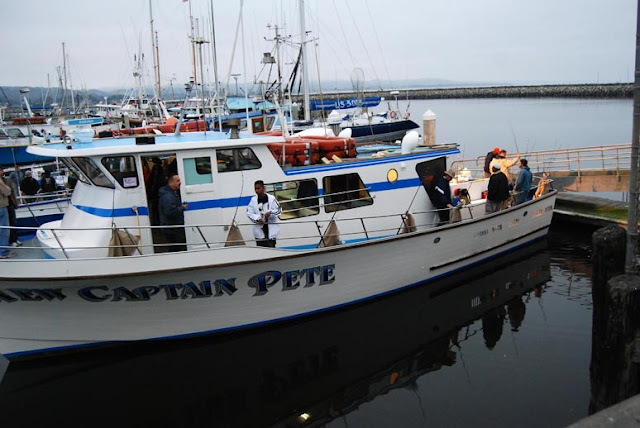 A fairly typical boat for Central/Northern CA pelagics. The SoCal boats are much bigger for those that have been on those. Water temperatures have dropped compared to the previous few years, and there is a ton of food for both fish and birds out there right now. Reports from early season trips (i.e. summer) have been very positive, so the fall is shaping up to be really good! For those thinking about planning a trip to California for pelagics, I will offer a number of suggestions. First, pelagic trips are very popular, and spots on the various boats are limited. Make your reservations as early as possible to guarantee yourself a spot! Third, if you book multiple trips, you might think about spacing them out a bit. While waters in Central California are usually not terribly rough, don't under estimate the energy you'll use birding and balancing yourself over the course of 8 to 12 hours. There are a lot of trips, so you could come for 6 days and schedule trips on only even days or odd days to give yourself a break between them. Fall pelagics don't usually get weathered out, but spacing them out a bit also buys you insurance in case the wind kicks up for a day or two. Fourth, the volume of bird tends to be highest in September but generally more rare birds are seen later in the season, notably October. 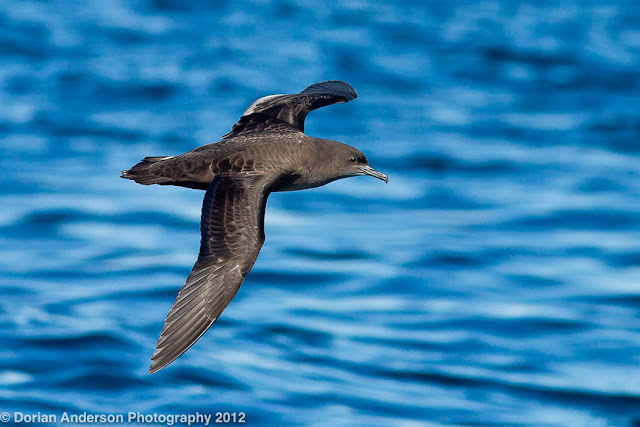 Do remember that people who have seen a lot of pelagic rarities have taken A LOT of pelagics over the years. Weird/cool stuff can show up anytime, so these are just general suggestions. Lastly, plan ahead to avoid seasickness. Everyone's threshold is different, but take what steps you think you need to prevent your day from being ruined by barfing. Ear patches work well but require a prescription (I think), so deal with that beforehand. Dramamine works fine and should be taken 45-60 minutes prior to getting on the boat. Wrist bands are a scam/joke and should be avoided completely. Getting a good night's sleep before the trip, eating small amounts throughout the day, and drinking plenty of water will all help prevent illness. 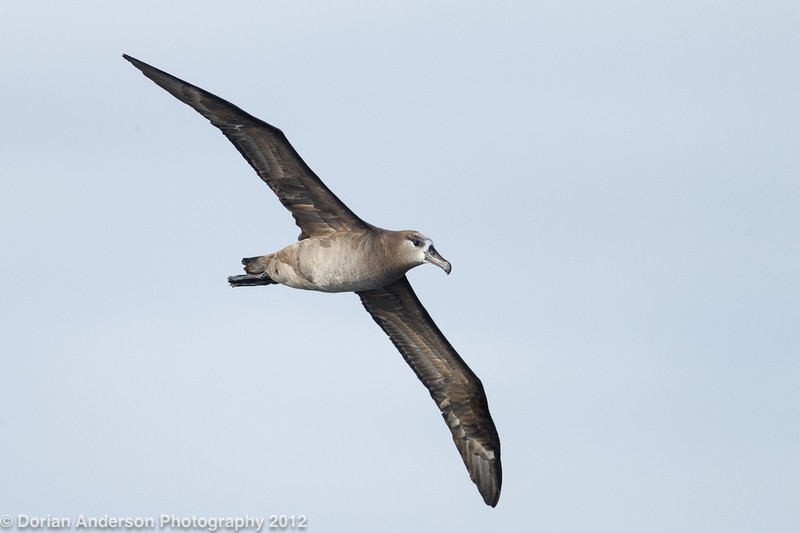 A note about pelagic photography - it is REALLY HARD! Pelagic birds move really fast and the boat is usually bouncing around, so getting close, sharp images of these speedsters is a challenge. You will need a fast shutter, something certainly less than or equal to 1/1600 with 1/2500 or 1/3200 being preferable. That's not an issue when it sunny but gets much tougher in cloudy conditions. Teleconverters can help in those bright, high contrast conditions but will greatly hinder your efforts to get flight shots when it's cloudy. So, you'll have to adjust based on the day and the conditions. Remember, you can always crank up your ISO to keep your shutter fast and fix the noise on a sharp, in-focus shot later. If a shot is out-of-focus or isn't sharp, they're ain't a thing you can do after the fact! So, hopefully this gives you at least a bit of info should you be thinking about coming to California for some pelagic birding. 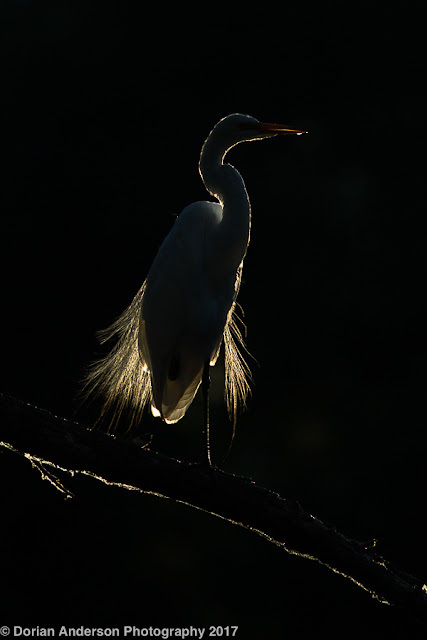 Fall is also the best time for terrestrial birding in California, so it would be easy to fill in some land birding around your schedule boat trips. Please feel free to contact me with any questions that you have, and I will do my best to point you in the right direction. It would be great to see some of you out on the water this fall! My pelagic schedule for this fall - Remember these a just a few of the many tips offered!